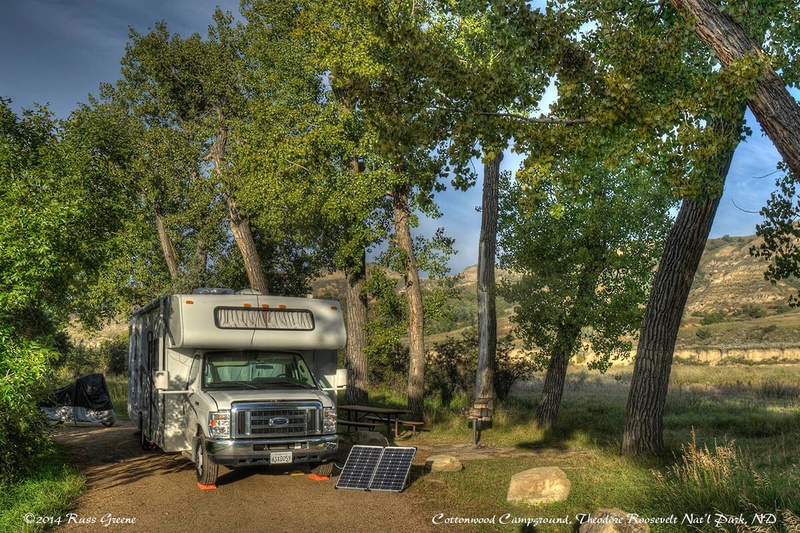 My RV family at Cottonwood Campground, Theodore Roosevelt National Park, ND: PeeWee my motorcycle hiding under his cover, rear left; Charlene, my RV, and Sunny, my solar panel. Access: Apart from the road resurfacing work at this time (Sept. 2014) the road to the campground is paved, as is the road in the campground. 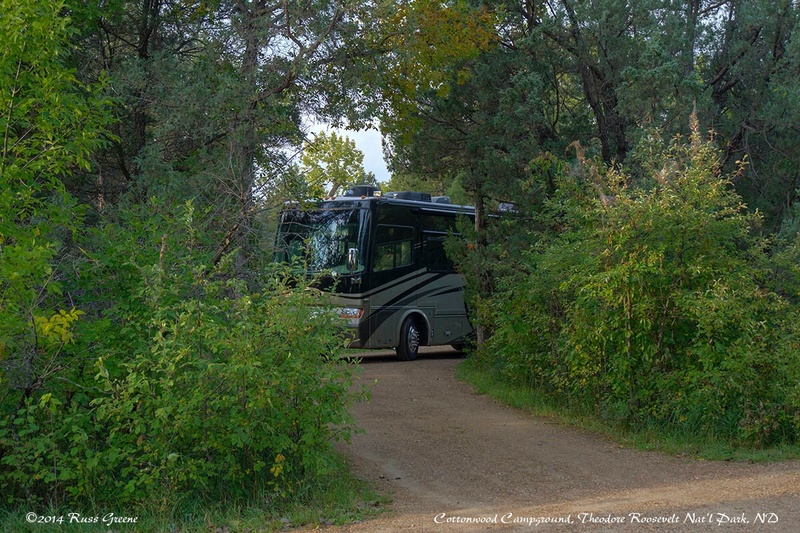 Much of the 5 miles of the old road to the campground can be very slow going for motorhome as there is a lateral crack ever 20-30 feet which makes for a very rough ride. I presume the road replacement will eventually include this section of the road. That portion of the road which has had the asphalt removed and is dirt was better than the paved section! Campsites themselves are dirt and gravel. Number of sites: 76, including pull-through, back-in, and walk-in sites; Group Sites: 1. Size of sites: In the pull-through loop many if not most sites were capable of accommodating large Class A motorhomes and their towed vehicles. At least a couple of them could have accommodated two full size Class As and their towed vehicles. Some of the “pull-thru” sites were really nothing but turnouts and suitable for smaller Class C. Sites in the back-in loop were much smaller. Tent pads: not in the pull-through loop. In the back-in loop there were areas cleared for tents. Over-the-air: I didn’t check but a neighbor said he received 3 NBC channels. Groceries: Don’t count on finding what you want in Medora. People that live there shop in Dickinson, I’m told. That’s about 47 miles from the campground. 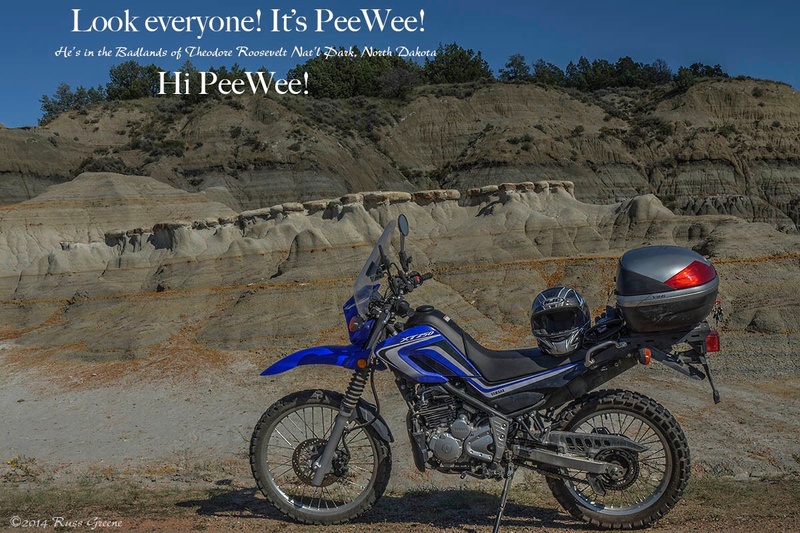 Other Campgrounds: Medora Campground and Red Trail Campground in Medora. I like this campground. It’s quiet and woodsy. There was a lot of cricket noise when I was there in mid-September, but road noise?, no, not really noticeable except perhaps from the walk-in sites at the far end of the back-in loop. Some of those sites also offered unobstructed views of the muddy Little Missouri river that runs past the campground. Sites are very close to level and spaced fairly well apart. It felt quite private in the pull-through loop as far as campgrounds go. 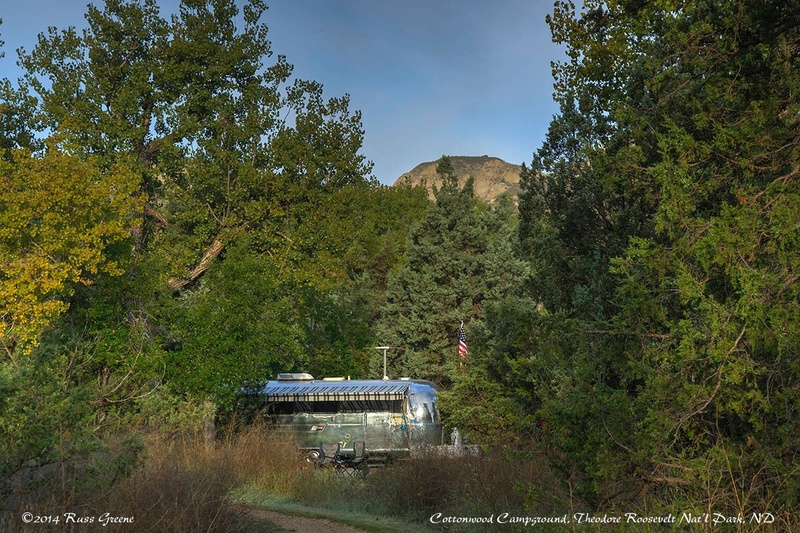 Views in both directions from my site were pleasing: on the campground side I saw bushes and trees and on the other a meadow and hills. The campground entrance is off of the park’s 36 mile scenic loop road which is a lovely drive. When I made that drive on my little motorcycle PeeWee my ride was interrupted by a heard of bison which were inconsiderately blocking the road. 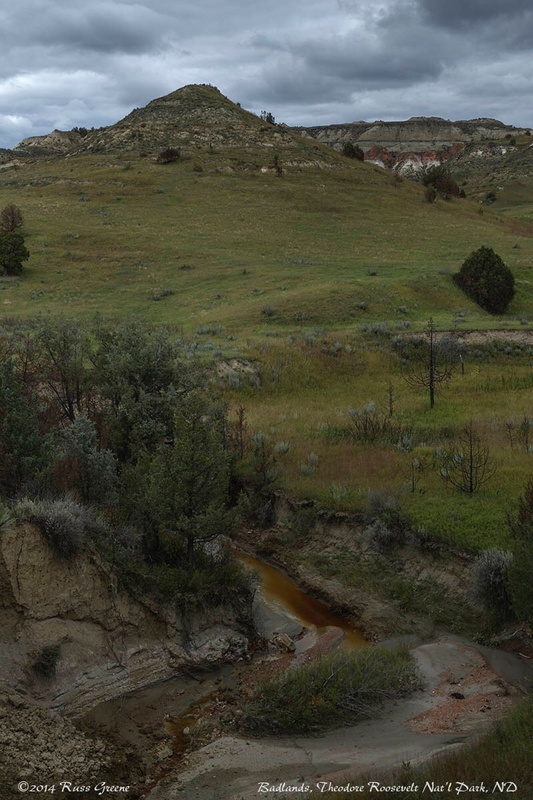 I saw wild horses along the road the next evening when returning to my campsite from Medora. 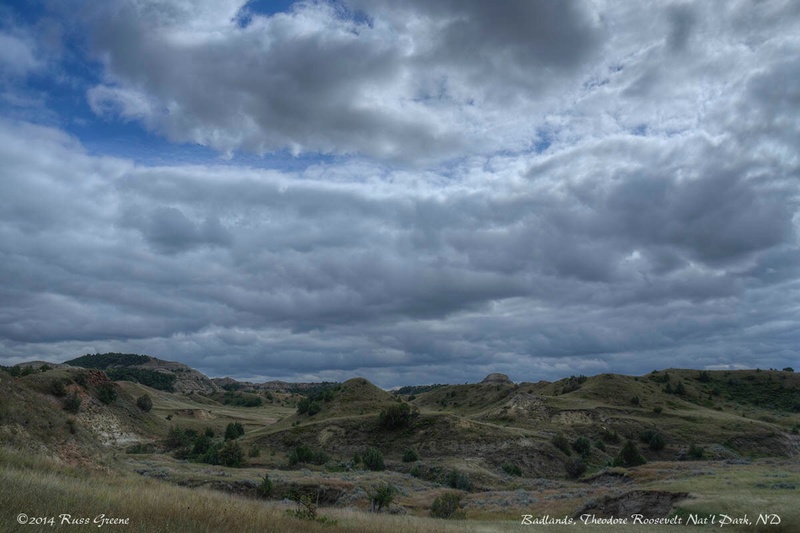 The day before writing this review I hiked the Lewis Creek trail through “the heart of the badlands”. 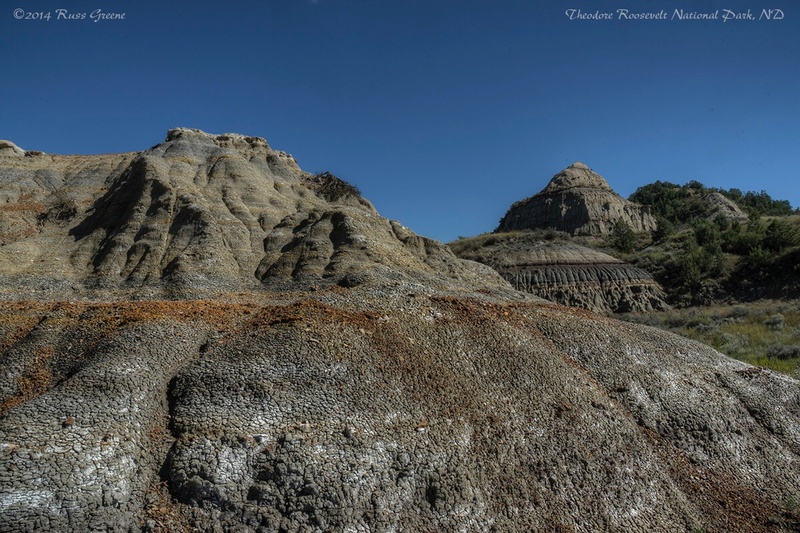 I think the badlands are misnamed and should be called “beautiful-lands”. Here too I was detoured by a bison, this time on the trail. I heard a coyote barking, and saw a pair of raptors as I walked amidst the beautiful scenery. 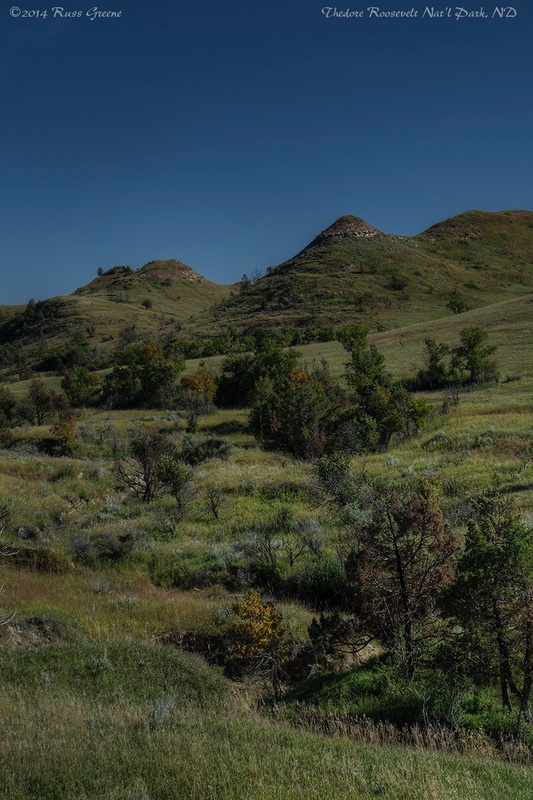 Theodore Roosevelt National Park has three discontiguous sections, or units: the north, south and Elkhorn Ranch which belonged to Teddy Roosevelt. 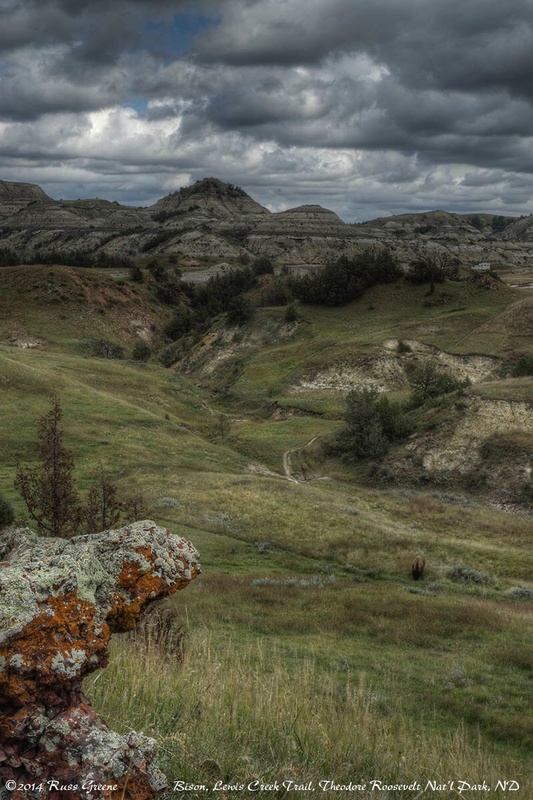 He is quoted as saying “I never would have been President if it had not been for my experiences in North Dakota.” He was known as a conservationist President. We need more of those. It’s been quite some time since I’ve been there. I had to go back and look at my Campground Report to check my photos and comments. I see a big Class A in one of the pics. Quoting from my report “Size of sites: In the pull-through loop many if not most sites were capable of accommodating large Class A motorhomes and their towed vehicles. At least a couple of them could have accommodated two full size Class As and their towed vehicles. Some of the “pull-thru” sites were really nothing but turnouts and suitable for smaller Class C. Sites in the back-in loop were much smaller.” If Class As can navigate the campground I expect you can too. Why not call the park office and see what they have to say? I’m pretty sure you’ll be fine. I’d also ask them about the current road condition. It was not so hot when I was there and there were construction delays, but they may have finished the repaving they were working on back then. Separately, if you shop at Amazon.com I’d really appreciate it if you’d bookmark my link to it and use it whenever you shop there. Just bookmark this: Amazon.com. Thanks! Thanks for your kind words, BTW. I read this post completely and this post is very helpful for me and contain a lot of information about the Recreational Vehicle. i read a another blog ,by which also give the RV news. And will write about Juniper campground there soon.